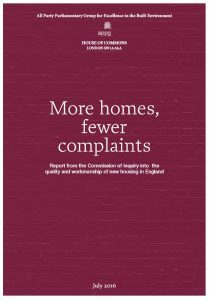 “7.12 there is no scheme which directly and comprehensively covers failings by the homebuilder – in the event that the industry fails in its efforts to bring about change, we recommend the introduction of such a scheme. 7.13 If we reach the point where it is necessary to recommend that a statutory redress scheme is introduced this will, unfortunately, mean that the industry scheme has been unsuccessful. If this were to happen, we would recommend a single statutory scheme to which all homebuilders are obliged to belong, set up independently of the industry, and funded by a levy on the industry. Recommendation 2: Housebuilding sales contracts should be standardised. Housebuilders have their own form of sale contracts, often with specific terms that are invariably designed to suit the best interests of the housebuilder. It is often difficult, if not impossible for new homebuyers, even with legal representation, to change or renegotiate most of the terms. Standardised contracts, with specific reference the procedure for dealing with defects and disputes would make to process clearer and fairer for consumers. So why do most of the large plc housebuilders routinely, often quoting “company policy” refuse access to both the new homebuyers themselves and their snagging inspectors until after legal completion? The only reason, as the HBF acknowledges, is because new homes are “not perfect at the time of handover” but they could and should be. Indeed, I would go further and say it is because the homes are not even 100% finished. I said in my submission, that buyers should have a mandatory right to inspect the new home they are buying before they legally complete. I would like this to go further, with a legal requirement for qualified inspectors (Professional Snagging Inspectors), chosen by the buyer and paid for by the housebuilder, to independently snag and inspect every new home before financial legal completion. New homebuyers are not best qualified or placed to thoroughly and fully inspect their homes. Recommendation 4: Builders should be required to provide buyers with a comprehensive information pack. Designs and plans, specifications etc. Details about both warranty and building control inspections, when carried out and by whom. For too long, housebuilders and their site-based sales staff have misled new homebuyers, often deliberately, even though it is against the law and the industry’s own Consumer Code to make misleading statements or withhold relevant information that would enable a buyer to make an fully-informed decision. This has resulted in many of the claims made using the Code Adjudication Scheme. Many others were dismissed due to lack of evidential proof from the buyer. A comprehensive information pack would provide indisputable evidence of the design, specifications, plans and standards the new home should be built to. As it would provide clarity for both parties, I cannot understand why this is not already voluntary standard practice across the industry. Housebuilders should also be required to give buyers written confirmation of all verbal representations. Recommendation 5: There should be a review of laws governing consumer rights when purchasing new homes. The often used saying is that consumers have more rights when buying a kettle or a toaster or even a Mars bar than they do when buying a new home is a fact. You cannot get a full refund if your new home fails to meet your expectations and is defective. As it currently stands, you may not even be allowed to see it before you own it. It is to be hoped this and other recommendations bring about a much needed change. Recommendation 6: DCLG should commission a thorough review of warranties. Establish whether the warranties currently provided are adequate; what the minimum requirements should be, how they would need to change to achieve the needed level of cover and what the cost implications might be. Establish easier form of redress with warranty providers as part of a New Homes Ombudsman role. At the moment, as financial bodies, warranty providers are covered by the Financial Services Ombudsman, which we were told was not always effective in dealing with the types of disputes we are looking at. Any review should including extending the housebuilders’ responsibility and liability for defects occurring for the first five years after completion, not two as at present, further encouraging housebuilders to be more focused on quality. Recommendation 7: Housebuilders should instigate a new quality culture by adopting quality systems to ISO standards. Whilst an admirable recommendation, in reality this is never going to happen. Defects in new homes are widely regarded as the norm, standard and inevitable. Buyers are even told to expect to have problems! It would take a complete mind-shift at every level within the industry for quality assurance and compliance measures to be adopted as standard and apart from PR statements and spin, I cannot see the HBF doing anything to drive this. 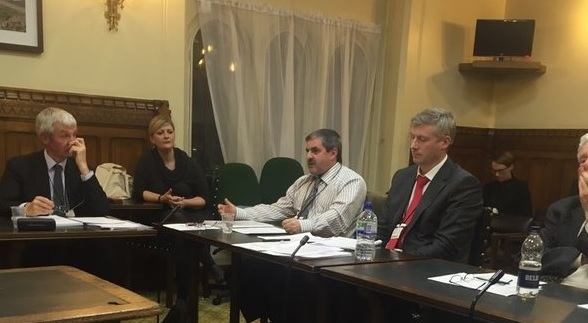 I suggested to the APPG Inquiry that new definitive quality and workmanship standards should be incorporated in both the building regulations and NHBC’s warranty Standards with “should be” guidance, replaced with “must be” requirements. Recommendation 8: The industry should significantly increase skills training programmes. The Construction Industry Training Board (CITB) was set up as long ago as 21 July 1964 to “work with employers to encourage training, which helps to build a safe, professional and fully qualified workforce.” In every housing boom since, more skilled people have been required and at the start of every slump, so called skilled trades people lost their jobs. Any new training initiatives devised by the industry itself, will be doomed to fail as they have repeatedly during the previous 52 years. Currently there are three times as many people are leaving (60,000 a year) the building industry as are joining (15,000-20,000). As the CIOB estimate that the cost of an average apprenticeship works out at around £24,000, so does it make economic sense for the industry to invest in training? Of course not that is why there has been a ‘skills shortage’ for over 50 years. To improve quality of new homes there needs to be a change of attitude across the industry at all levels. It is not a skill, but a desire to care, take pride and have a moral conscience. Recommendation 9: A minimum standard should be set for compliance inspections. There are currently eight stage inspections (six are mandatory) required for Building Control. The NHBC told the Inquiry that every home it inspects [for its warranty presumably] is visited five times; “purely to prove to our underwriters that the property is standard risk”. I suggested there should be more inspections and that every home must be inspected at each stage not just those on sites risk assessed at for likely or possible non-compliance. During my presentation I called for a fully independent new home customer satisfaction survey, with all results for each housebuilder made public along with the NHBC 9-month survey results. The NHBC, warranty provider for 80% of all new homes built each year, acknowledges that more could be done to improve both quality and satisfaction. It said that: 0.7% of warranty holders each year have problems stemming from latent defects which constitute a valid claim.” However, this does not reflect defects in homes not judged by the NHBC to be “valid claims” which account for around 9,000 homes each year. The NHBC confirmed that “satisfaction levels from their 9-month survey are generally 5% to 10% lower than those measured at eight weeks.” This would put most builders firmly into 3 star rating territory, demonstrating a fall in satisfaction levels once their customers realise just how bad their new homes are and the indifference of their builder’s to fixing problems. The housebuilders can (and do) freely and easily manipulate their customer’s satisfaction survey responses and have even encouraged their buyers through threat or favour to give positive responses than they might otherwise have done. Fully independent gas and electrical installation safety inspections. There should be an end to the current box-ticking, self-certification by those installing. Building larger and healthier homes. Revision to the building regulations to include the new space standards and a minimum natural light lux levels for each room. Introduction of new minimum standards for customer service. End state funding and government help such as Help to Buy for housebuilders that fail, rated three stars or less and fail to win sufficient NHBC Quality Awards. No housebuilder should be allowed to encourage their buyer to use any particular firm of solicitors or mortgage broker. Minimum build durations in Building Regulations and Warranty Standards as more time to build will result in better built, higher quality new homes. No new home should be constructed in a time-scale of less than 12 weeks. A new rule that only homes independently inspected four weeks prior to a housebuilders’ year-end would be allowed to legally complete before the financial year-end to prevent homes being rushed. A legal requirement for building projects over a certain value/size to have an independent, qualified inspector on site full-time, every day for the duration of the building works. An end to “gagging clauses” aka confidentiality clauses used by both housebuilders and warranty providers such as the NHBC. Consumers have a right to know what settlement was reached. Openness and transparency can only improve quality, service and trust in the long term. Limit the practice of landbanking by large plc housebuilders to encourage more competition. All warranty providers should be regulated and independently audited. Just how “passionate” are these MPs about seeing their recommendations implemented? 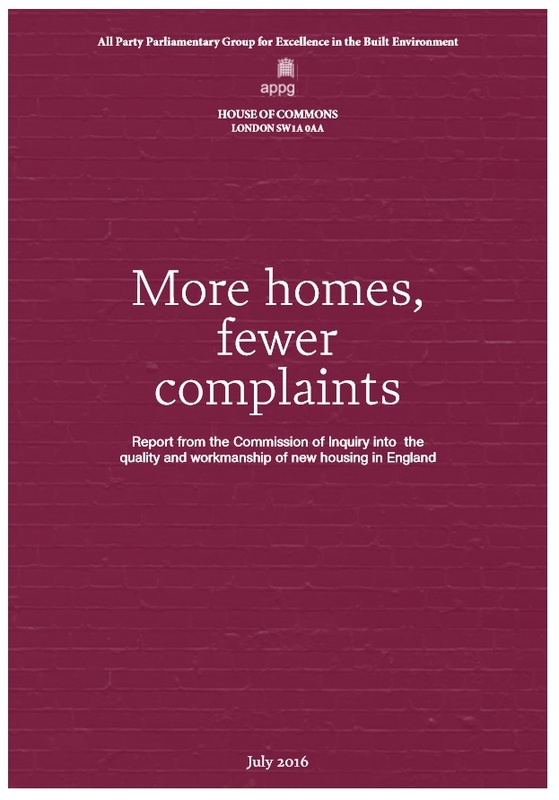 This entry was posted in New Homes and tagged APPG Inquiry Into Quality of New Homes, Consumer Code for Home Builders, customer care, new home warranty, new homes ombudsman, quality, standards. Bookmark the permalink.